One of Nadias key styling elements is the split header menu. Menu items are automatically evenly split by the template to place your menu items on either side of the centered logo image making your branding central to your website. ON scroll the header area include your menu and logo gently slides from view. In Nadia we have included wide collection of coloring options for almost every element of your design. These allow you to quickly and easily style your site to match perfectly with your project color guides. For an idea of the full scope of these coloring featured ensure to check out some of the example styles available within the demo of the template. Bundled with our Nadia template is a number of key module extensions allowing you to quickly implement some elements in to your site design. These include an animated grid gallery module, a thumbs gallery module and our versatile carousel module. 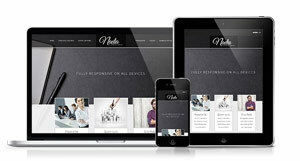 Nadia comes fully responsive so you can expect perfect viewing across all screensizes with a host of responsive options allowing you to disable module positions on smaller screens. Based on Bootstrap, Nadia also allows you to use Bootstrap classes to disable individual module using the 'Module Class Suffix field (eg. hidden-mobile etc). Translate your imagination to your desktop with Nadia!